Plans for next summer’s London Olympics are kicking off and a big part of the planning involves the nominations for the Olympic Torch relay. Perhaps very telling of our time, James Law, a computer scientist at Aberystwyth University has nominated a robot to be part of the London 2012 Olympic Torch Relay. Specifically, the 3ft tall iCub robot, has been nominated by Dr. James Law from the Department of Computer Science to mark the centenary in 2012 of the birth of Alan Turing, the father of modern computer science. “2012 will mark the 100th anniversary of the birth on Alan Turing, the founder of computer science and a figurehead for the code breaking efforts of WWII. A robot torch-bearer would be a fitting tribute to Alan Turing, and an inspiration to future generations of scientists and engineers…Alan Turing is widely known for his role in developing computing methods for code breaking in WWII, but this is only a small part of his truly inspiring work. He created one of the first designs for a stored-program computer and laid the foundations for the field of Artificial Intelligence. These achievements led to the computerised era we live in today, and prepared the way for the robotics research being carried out here at Aberystwyth University,” said Law. While I would love to see iCub take part in the official Olympic Torch Relay, it might be a tad too uncomfortable for some to see a robot replace a human in such an honorable ceremony. However, I do believe, it is only a matter of time. Just last week, we reported on Mr. Evolta 6′ 7″ green and white bot that has scaled up a rope of more than 1700 ft. in less than 7 hours at the Grand Canyon, has walked the 311 miles from Tokyo to the old Japanese capital of Kyoto and driven the Le Mans racetrack for 24 hours. Next, he will be taking on Hawaii’s grueling Ironman triathlon course. We should be proud to have little iCub bearing an Olympic torch next year, for no other reason than iCub is a beautiful example of human’s technological capabilities. With its cute white face and big eyes, iCub is designed to learn from experience and adapt to changes in its environment, just like a human child. The bot was designed by the RobotCub Consortium and is open-sourced, with the hardware design, software and documentation all released under the GPL license. The name is a partial acronym, cub standing for Cognitive Universal Body. 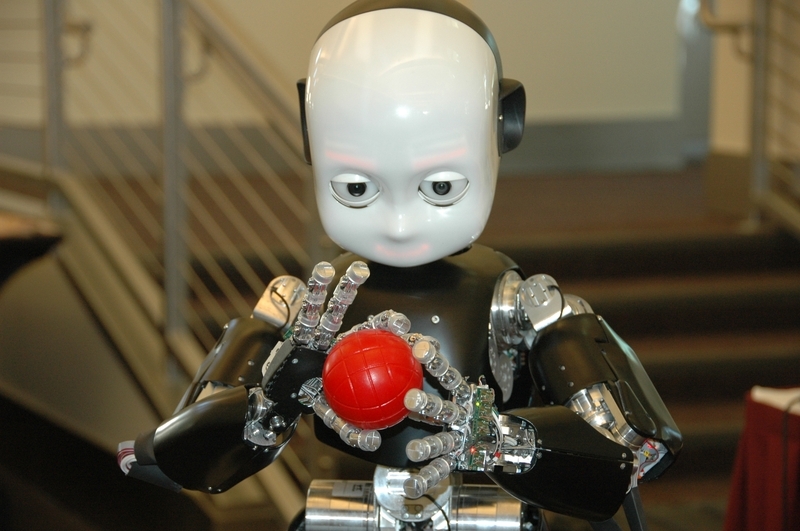 iCub will be the least of our concerns if research and development in humanoid robotics continues. My question to you is, when do you think we’re going to start having to ban robots from competing against humans in the Olympics?